Industry came surprisingly slowly to Greenwich Marsh – despite the fact that Greenwich itself was a bustling manufacturing town from at least Tudor times. Early industrial development spread from two areas – a settlement at the end of the road now known as Riverway and from Enderby Wharf. Much of the central area of the marsh retained a rural character into the late nineteenth century. 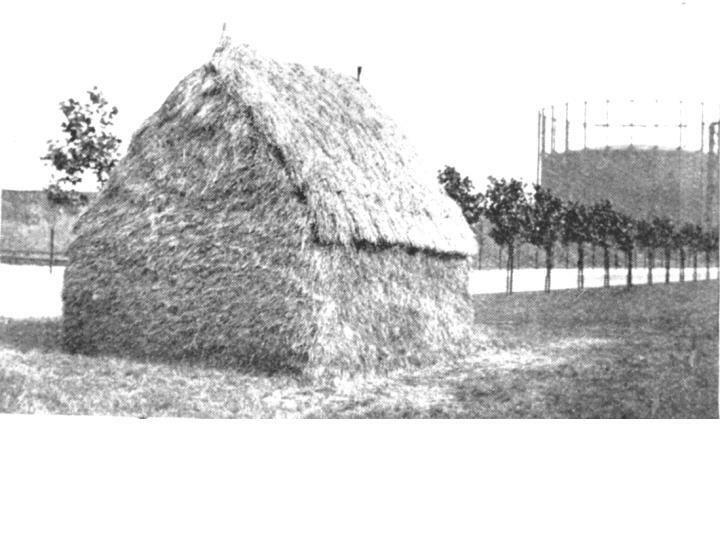 There is even a photograph of a small haystack that dates from the 1920s. (Co-partnership Journal 8/1926 captioned ‘a rural scene in East Greenwich’). It clearly shows the East Greenwich gas holder and appears to have been taken in Tunnel Avenue – since the trees, now mature planes, are saplings. Is it some sort of joke? Some elements of a rural economy were to remain on Greenwich marsh for many years. Throughout the early nineteenth century fields were let to a Mr.Wheatley, who ran a local horse omnibus service – a reminder that the factories described were surrounded by meadows used for grazing. Wheatley had run a major network of routes but by the 1860s was reduced to plying between the local railway stations. (Neil Rhind. Blackheath Village and Environs 1790-1970. Vol.1. The Village and Blackheath Vale. Bookshop Blackheath Ltd. 1976 and R.G.Thomas, London’s First Railway). Nevertheless there were horses to feed and throughout the nineteenth century Wheatley could be found renting meadows from Morden College. At the end of the seventeenth century a large building, by any definition ‘industrial’, was established on the west bank of the marsh. This was a Crown establishment and it marks a change in the way the Marsh was exploited. Work on ammunition was carried out in the Tilt Yard at the Palace and later moved to Woolwich to become, in due course, the Royal Arsenal. Greenwich lay between the two Royal Dockyards at Woolwich and Deptford – both producing warships in need of guns and ammunition. A complementary activity to armaments manufacture was the storage and distribution of gunpowder. Up until the seventeenth century the Ordnance Office stored this in the Tower of London. In 1694 the Principal Officers to the Office told the Treasury that they needed money for a new ‘Powderhouse’ somewhere convenient where gunpowder could be delivered by the manufacturers, then tested and distributed as required. What was needed was a remote riverside site near London, and the area of Greenwich marsh must have seemed ideal. 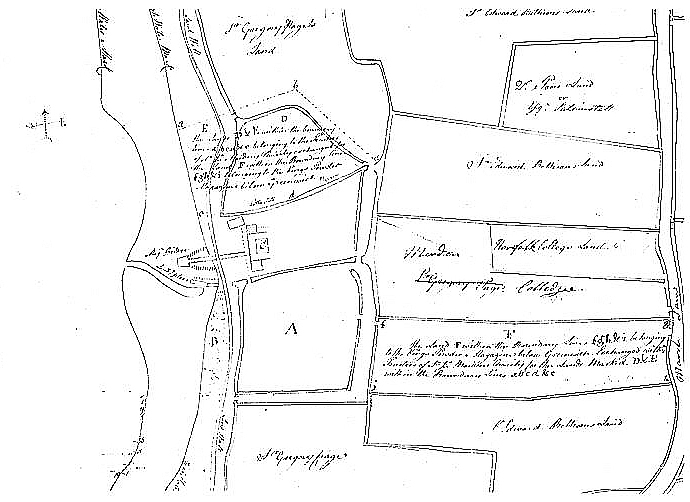 The site chosen for the gunpowder depot was on the West Bank of the Marsh – near where Enderby House stands today. (Basic information about the magazine can be found in Hogg, pp. 106-7. Hogg gives references to material in the Public Record Office – one of these, relating to its purchase by Vansittart, I was unable to find. More details of the day to day running of the depot can be found in the Minute Books of the Ordnance Department – from them a very detailed picture indeed could be built up but it would take time and patience to work through the volumes. Of great help in this context is Jenny West’s Gunpowder, Government and War in the Mid-Nineteenth Century. Royal Historical Society Studies in History 63, 1991. Since writing the book I have to thank Peter Jenkins, who did have the patience to go further through the records, discovered a minute which established a closing date for the depot as 1770, and this was duly reported in the Newsletter 25, October 1998 of the Gunpowder Mills Study Group. Most importantly reference must be made to Peter Guillery’s, article, with P.Pattison, The powder magazine at Purfleet, The Georgian Group Journal, VI 37-52. Other references by the Gunpowder Mills Study Group are: No.22 June 1998. Alan Crocker – Review of my article about the depot in Bygone Kent . No.21 August 1997. Mary Mills. Critique of Peter Guillery’s article (see below) on the Purfleet depot on its siting of the Greenwich works. No. 19 August 1996, Wayne Cocroft comments on an illustration of the depot. In addition, I have written The Explosive Magazine at Greenwich, Bygone Kent, Vol. 18. No.12 Hugh Barty King wrote ‘A Scratch Surveyor’ , the history of Drivers Jonas which is described as a ‘pastiche’ written in a ‘factual, fanciful and imaginative’ manner. However, it is claimed, with no source given, that in 1799 Nr. 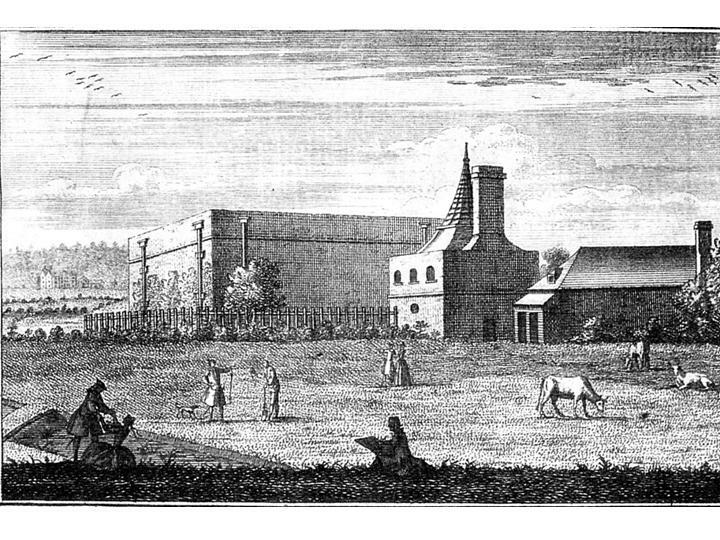 A.P.Driver executed a plan of the Greenwich Powder Magazine commissioned by the Surveyor General). The use of water transport meant that wharfage arrangements at the riverside were most important – it would be a very busy area with some large vessels calling. The wharf itself was known as ‘the bridge’ and there were two pairs of gates to the waterside from the factory. Not surprisingly Greenwich residents did not appreciate the presence of this large store of explosives on their doorsteps. In 1718 and again in 1750 they petitioned Parliament to have it removed. “Reason for removing the Magazine of Gunpowder at Greenwich to some more convenient place and further Distance from the said Town and the Cities of London and Westminster. What happened to the buildings after they were closed? The Government inspectors had said that they were ‘improperly and dangerously situated’ and ‘utterly incapable of being effectually repaired’ and they appear to have been demolished in 1770. ( Since writing this I have passed information by Peter Jenkins for a WO order for demolition.) Thirty years later the site was apparently sold, to Henry Vansittart – a Vice-Admiral and father of the future Lord Bexley (This reference is taken from Hogg. I was unable to trace his footnoted reference in the Public Record Office. However the 1770 St.Alfege Poor Rate’s list ‘Henry Vansittart’ as owner of ‘Dog Kennel Field’. This is not the site of the gunpowder depot but it is adjacent to it and it may be that Vansittart was consolidating land holdings in the area. Beryl Platts. [A history of Greenwich, Proctor Press 1973] notes a mansion at the bottom of Maze Hill, demolished in 1821 for the construction of Park Vista. This house was bought by Henry Vansittart in 1768 and his family lived there while he worked for the East India Company as Governor of Bengal. He died in 1769 and his son Nicholas remained in Greenwich to become the future Lord Bexley. Hence ‘Henry Vansittart’ in both of these records refer to someone who was already dead). There was an echo of the public disquiet about the works in 1815 when a private gunpowder magazine was planned in Charlton. A petition was quickly put together pointing out the fears that local people had had about the old magazine. In 1846 a pub in Eastney Street was burnt to the ground. It was a dreadful fire – a bedridden old lady was only rescued through the ‘bold daring of a young sailor.’The pub’s name was the ‘Royal Magazine’ – evidence that the Gunpowder Depot was remembered, if only by Greenwich drinkers. (story taken from Kentish Mercury. 31st March 1846). As the eighteenth century progressed there were signs of the arrival of new industries. There may have been a bleaching business before 1770 at Dog Kennel Field, described as a ‘Whiters House and Garden‘. (This appears as a reference in the 1770 St.Alfege Poor Rate book. In such bleaching processes cloth would be stretched out on a ‘tenters ground’ having been treated with a chemical to accelerate the process. A sulphuric acid solution might have been used, which may be associated with the copperas industry locally. The only way to guess the location of plots in the rate books is to assume that they are sometimes listed sequentially – although this is not always the case. If in this instance they are sequential then the plot is next to ‘Dog Kennel Field’ , noted above, and thus is on the south side of the Gunpowder Depot). This probably meant it was used for the bleaching of paper or cloth. If so it was in effect the first commercial industrial premises on the marsh. Seventy years later a ‘bleaching house’ appears on a deed covering an area at the western end of Bendish Marsh Maybe it had some connection with the Enderby family’s ropewalk.